The theme of the Outer Coast calendar is the experience of life on the coast of Alaska, an area of rich wilderness and interesting people. 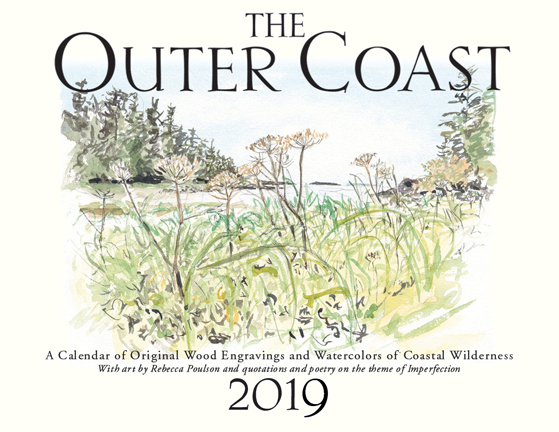 The Outer Coast wall calendar has been published and printed in Alaska since 1995. It features wood engravings and watercolors of wilderness beaches, botany, fishing boats and Alaskans by Rebecca Poulson as well as contemporary Alaskan poetry and classic poetry and quotes. Many of the images you see here are from wood engravings, a printmaking process that was common during the 19th century. My limited edition wood engravings include include scenes of boats, wildflowers and landscapes. Several of my wood engraving Images are available as note cards. The Outer Coast Calendar is printed on natural-color paper, in Juneau, Alaska U.S.A.